It can be pretty annoying to your roommate if you get back to your dorm late at night and flip on the lights. Even if you guys get along well, we can assure you that no one likes being woken up in the middle of the night. Then again, stumbling around in the dark and tripping over various dorm room supplies isn't a better alternative. Instead, keep one of these Multi-purpose Touch Lights (2 Pack) by the door. 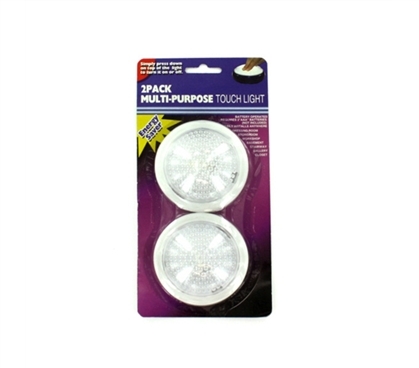 These dorm lights can act as portable lights, or can be easily affixed to most surfaces. You can keep one near your door so that when you do come back, you'll have enough light to see, but it shouldn't be bright enough to wake any sleeping roommates. These small lights for college dorms are also useful for giving some extra light to your closet space or underneath your dorm bed. Having to rely on using your cellphone for a light just to find whatever dorm accessories or college items you're looking for under your dorm bed or in the closet gets pretty annoying. So make dorm life convenient, not annoying. These little lights can also be useful for studying at night. They make great desk lights or reading lights, and again, you won't have to worry about disturbing any sleeping roommates.